Fiber lasers are a specific subset of DPSS lasers where instead of a crystal being used as the gain medium a doped fiber optic cable is used. Typically they are doped with rare-earth elements, such as erbium, ytterbium, and neodymium just like the crystals used in most DPSS laser systems. Fiber lasers have several advantages over traditional DPSS lasers all of which derive from the geometry of the fiber optic itself, namely the innate ability to have an extremely long single-mode optical cavity. 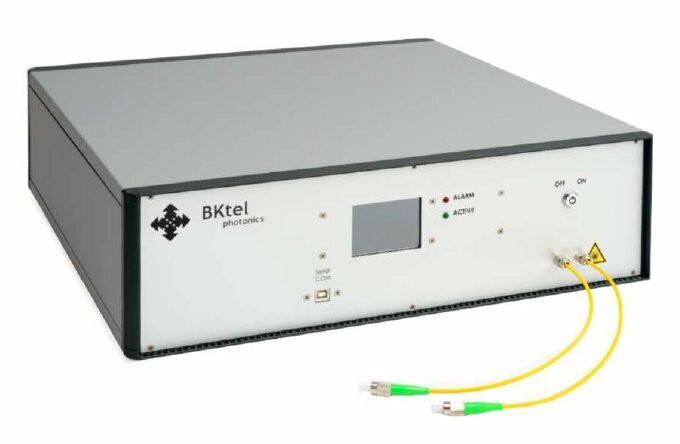 This geometry allows for the production of either extremely high-power single-mode lasers producing unprecedented brightness, or extremely narrow band lasers with near perfectly single frequency output. Additionally, fiber lasers can be q-switched or mode-locked to produce high peak power, high energy, and narrow linewidth pulsed lasers. 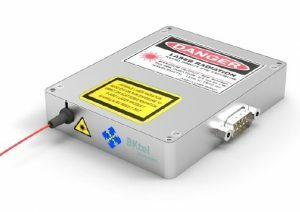 Because of this wide range of configurations fiber lasers are used in an equally wide range of applications including LIDAR, drilling, and two-photon microscopy. Fiber lasers are available with either continues wave (CW) or pulsed outputs and with powers ranging from 100 milliwatts to over 100 watts. Additionally, through the use of second, third, and fourth harmonic generation they can emit wavelengths from the green through the infrared. OEM fiber laser packages and modules are available.